Here are a few images from the 1927 dig. We hope to unearth the originals to get better quality copies. If you have any photos (or other information) we could use, please get in touch. J B Himsworth-An Eyewitness Account Of The Discovery of Sheffield Castle. Who is the intrepid lady in what is a completely a completely unsatisfactory by modern h&s standards excavation? Watch this space. I was just wondering if you’ve seen the photos of Sheffield Castle excavations on the picture sheffield website, http://www.picturesheffield.com. 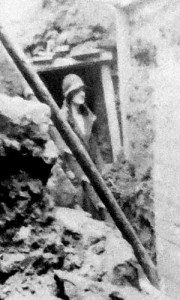 The search facility is a bit clunky, but there are loads of pictures from the excavation in the twenties.